Why I don't have an Electric Company T-Shirt. 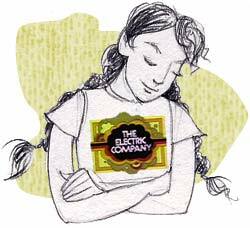 A couple of months ago, I saw an awesome tshirt with the Electric Company logo on it. I thought, this is so going on my birthday wish list, when I saw the price tag - $24. In my world, tshirts cost at most, $12, and no matter how much I loved to yell "Hey, you guys!" in the 70's I was not spending that much money on a shirt. So I thought, how hard can this be to make? Find the logo online (or scan it from the record cover - yes, we had it), clean it up on the computer, print it out on transfer paper, and iron it onto whatever shirt I wanted. I told a couple of other people and they wanted one too. Cool! But then I've been doing a lot of thinking lately, about copyright, and what's stealing, and what's not. I thought, how would I like it if I was selling shirts of my artwork and saw someone walking down the street with a knockoff? I'd be pretty upset. In fact, I would be upset even if I had no shirts of my artwork and someone made one - however flattering to me that's meant to be, I still would have had no say in the quality and no compensation (monetary or otherwise) for my work. I've spoken to other artists about this, who agree that when you break it down like that, it's really not a good thing. And one of the things I feel worst about was that I didn't make some great fan shirt all on my own as a tribute; I saw something and tried to copy it to save the cash. Okay, so I still like the shirt. So I looked it up online to see if I could get a bargain somewhere, and found that proceeds go to Sesame Workshop, an organization I respect highly. (They are non-profit and one of their main goals is getting quality children's programming, like Sesame Street, worldwide.) So now I may actually buy one, knowing that the money is going to a good cause. And that's why the only place you'll see me in an Electric Company tshirt - unless I break down and buy one - is in the sketch above.